If the church has a web page for the adult choir, and wants an online directory just for the choir, they can use the org ID method and post a link to the directory on that web page. The link can also be posted on the Members Only Page for the Adult Choir organization. Or, you can email the link to your choir members reminding them to bookmark it in their browser. As new members are added to the choir, they will display in the online directory and will be able to access it. 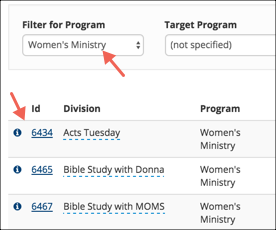 Your Women’s Ministry might have many different organizations and you want the directory to contain everyone enrolled in any of the organizations. As long as you put them all in the same Division, you can use the Div ID method and post a link to the directory on the page of your website. Because each org must have the Publish Directory flag set to ‘Yes, Publish Directory’, you do not have to include every organization within the division. Without that flag set, an organization in that division would not be included. Or, as with the organization type of directory, you can email the link to the members. Also like the organization directory, as people are added or dropped from orgs in that division, they are added and dropped from the online directory. For this, you would use the Status Flag method, with the Status Flag search including only those with a Member Status of Member and whatever other criteria you wish to include, such as an age or resident code. The URL link for that directory could be posted anywhere on the church website, so that it is easily accessible by your church members. Status Flags are automatically updated very early each morning, so people will be included or excluded from the directory based on that Status Flag update. Each database can have only one online picture directory that uses a Status Flag. However, they can have Organization or Division directories in addition to the one Status Flag directory. If a person is not included in the Status Flag, organization or division used for the directory, they will not be allowed to view it. Even if you use a Status Flag for the directory and it includes large numbers of people, you can still post the link online and be assured that it will be viewable by only those with that Status Flag. If someone does not want to be included in an online directory you handle this based on the source for the directory. If you are using an organization or division for your directory and someone does not want to be included in it at all, create a Sub-Group in the organization (if using a division, find the organization in that division in which the person is enrolled), name it DoNotPublish , and add those people to that sub-group. One simple way to do this is to open the Member Dialog for someone that does not want to be included in the directory. Click the Groups tab and enter DoNotPublish in the text for a new Sub-Group. Then click the green Add New button. This creates the sub-group and adds that person to the group. You can create the sub-group ahead of time, or wait and create it when someone needs to be added to it for the first time. If you are using an organization or division for the directory, and check the No Not Publish Phone Numbers flag for an individual on their Personal tab, they will be included in this online directory, but their phone numbers will not display. If you are using a Status Flag as the source for your directory, you will create an Extra Value named something such as DoNotIncludeInDirectory with a value of true. Then exclude anyone with that Extra Value in your Status Flag search, so that only those without that EV will be included in the search results. You can name the Extra Value anything you want, you just need to be sure that the Status Flag search that you use for the directory will exclude anyone with that EV on their record. When using a Status Flag for your directory, the exclusions will be based on an Extra Value. Create a search to find those you want to include in the online picture directory. Suggestion: If you want this for your church membership, your search would be those whose Member Status is Member. Your search must also include a Condition to exclude the EV you are using for those who do not want to be included - that is, the exclusions. Save your search using the Status Flag naming convention. After you have both of these done, you are ready to set up the directory. Go to Administration>Setup>Settings and add the following new setting code clicking the blue check mark to save it. In the Setting Value field enter the name of the Status Flag search you are using for this purpose. Do not use the colon and only enter the first part of the name. See image. Click the blue check mark to save. The SQL Script and the Template will automatically get added to your database when you run the directory for the first time. This will display the people who are included in the Status Flag you entered in the Settings and create the default Script and Template. Now verify that the SQL Script and the Text Content are in your database. Go to Administration>Setup>Special Content>SQL Scripts and you will see a script named PictureDirectorySql . This script will be the same for every database. Next go to Administration>Special Content>Text Content where you will see a file named PictureDirectoryTemplate . This template can be changed based on the specific information you want to include/exclude from your online directory. We have the code for the default template and for one more template included in this article. If you are using the default Template, then you are ready to make the directory available. See suggestions in section above regarding multiple directories. If you want to use a different Template, see information below regarding templates. The instructions below include creating the directory for an organization when you also have an online directory using a Status Flag, and creating one for an org when you do not also have one using a Status Flag. Exclusions are handled differently for Org and Division directories than for Status Flag directories. See the Exclusions section above. In the Setting Value field enter the Org ID# of the organization you are using for the online directory. If you are using a Status Flag for a church-wide type of directory and also want to have a directory for one or more organizations, skip Step 1 and leave the Setting set as the Status Flag, and continue with Step 2. Go to the organization itself and click on the Settings>General tab. Click Edit and under Advanced Setup select Yes Publish Directory . Click the blue Save button. If you have not already created the sub-group named DoNotPublish for those who do not want to be included in the online directory, do so now. See the paragraph above Step 1 in this section (Exclusions). If you are using an organization for an online directory whether or not you also have a Status Flag that you are using for an online directory, each organization that you use must have this flag set as Yes Publish Directory. This will display the people who are included in the organization whose ID you entered in the Settings and are not in the sub-group DoNotPublish. The number will be the Org ID # of the organization you are using. My sample org was #35. This will display the people who are member in the organization and are not in the sub-group DoNotPublish. If you want to use a different Template, see information below. Filter on Organization > Search for the Program > Division that you want to use for the directory. Go to each organization and click on the Settings>General tab. Click Edit and under Advanced Setup select Yes Publish Directory . Click the blue Save button. If there are organizations in that division that are not to be included in the directory just leave the setting as No Directory . If you have not already created the sub-group named DoNotPublish for those who do not want to be included in the online directory, you can do that now. Or you can wait until someone requests to opt-out from the directory. Find the Division ID for the division you are using for the directory by going to Administration > Manage > Divisions . Select the Program in which the Division resides and then find the Division in the list. The Division ID is in the left column. The last d in the URL is what indicates that the ID is for a Division instead of an Organization. After entering the URL, press Enter . This will create the necessary text and SQL files in Special Content and will display the new directory. See Steps 4 & 5 above for information regarding the Special Content files and verifying that they are in the database.